The Complete Edition is also available. All versions use GameShield IronWrap DRM. Rockstar have not disclosed details of how many machine activations are allowed nor any other restrictions. Patch_2617_0_0_0.exe is the latest version. Manual installation is required when using the retail version on Windows 8 and later or if the automatic update fails. The Rockstar Games Social Club client should update automatically; the latest version can be downloaded from Rockstar Games Social Club page. Allows the manual creation of save points during a mission and to reload part-way through a mission. This allows one to attempt different dialogue options without restarting the mission completely. 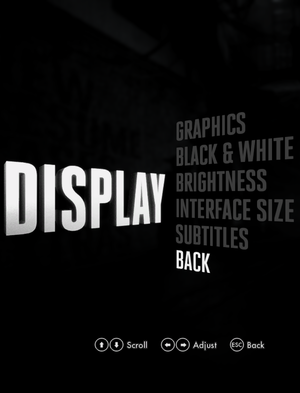 Widescreen Fixer only supports 30 or 60 FPS. Messes up the cars handling: acceleration is too fast, steering is too sensitive and brake is too slow. Download and launch Widescreen Fixer. 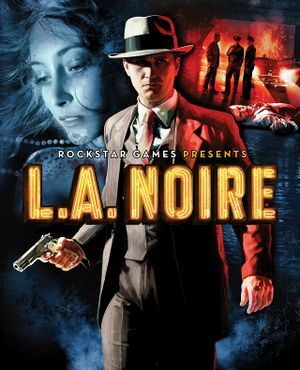 Select L.A. Noire from the games list. Check Enable FPS Cap Fix and 59.940 FPS. Save the settings and launch the game. Press * to unlock the frame rate while in-game. Disabled by default. Can be enabled in the options menu. Full in-game support. Launcher does not support controller input. Game pauses itself and pause menu has no audio. When starting the game, a Social Club "Corrupt License File" error message is displayed and the game refuses to start. This problem may occur if the game is not installed in Program Files in C:. Installation of the game will not work on partitions formatted using FAT32. This problem occurs in Steam when the progress of the download indefinitely "suspends" around the 90% point. This is due to the fact that FAT32 has a file size limit of 4 GB. cases_1_1.big.pc weighs at around 5.17 GB, which is way beyond what FAT32 can handle. Recommended course of action is to relocate the installation to an NTFS partition. After logging into your Social Club account, you will be prompted to exit by pressing ESC. After pressing ESC, the screen does not advance to Main Menu. 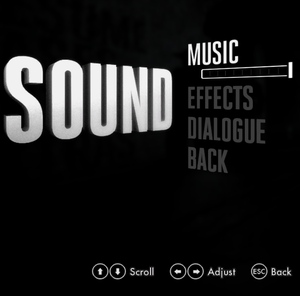 The music will be rolling, but the Social Club UI will keep on Pop Out but will not continue to Main Menu. You will notice 2 Social Club UI (32 bit) in Taskmanager. Seems to happen for Windows 10 64 bit Users playing with Steam's L.A. Noire Complete Edition. You may be able to fix this issue by using an offline rockstar profile. Go to create account, and click on the little gray link that says use offline profile for this game. You should now be able to login within LA Noire. Anti-Virus Related Issues where game files are misrecognized as malware. .NET Framework 3.5 or C++ runtime libraries are not properly installed or configured. Firewall prevents game from making a connection to the internet. Compatibility options are set incorrectly on Steam. Right-click on Steam.exe, choose Properties. Uncheck any boxes that are checked, and click Apply. Then, click the Show settings for all users button. Again, make sure none of these boxes are checked, and click OK.
On 64-bit Windows 7, the game might freeze as soon as the synchronization (refresh) symbol shows up, which appears right after the Team Bondi logo. This is due to the game being incompatible with the current version of the .NET Framework 3.5 installed into your system. This is also the main reason why the associated .NET Framework installer provided with the game won't install. Type optionalfeatures.exe and press ↵ Enter. Click OK. .NET 3.5 will be disabled and the user must restart. On next boot, go back and check Microsoft Framework 3.5.1. This will re-install .NET 3.5 and correct the issue. If this does not work, run the .NET Framework clean-up tool, and then repeat the above steps. If the problem persists after following the above, delete ypatcher.exe from <path-to-game>. The game should start up. Make sure that Steam is closed. If you want to automate this process a bit, AND don't have Steam set to automatically start when your PC logs in, you can go into the compatibility settings, and enable run as administrator. However, this results in a slightly annoying prompt that appears before Steam signs in saying that "compatibility mode is enabled" and might cause issues. Run the LANLauncher.exe in <path-to-game>. Enter -str and/or -npd and/or +jobs_numThreads 0 (with a space between each command) in the Command Line field to enable a single threaded renderer, which may improve performance or compatibility on some systems. 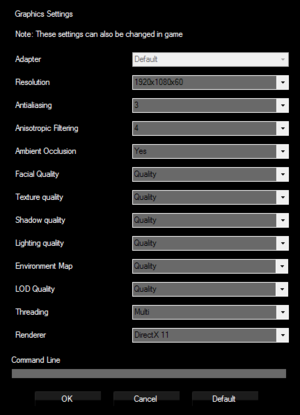 If the problem persists, switching the Renderer field to DirectX 11 in the same options menu can also improve performance significantly. It is recommended to first follow Rockstar's official instructions, and if this does not work then to follow the instructions below. Download this file containing fixed cases.big.pc and out.wad.pc files. Extract the .rar file to <path-to-game>, overwrite if asked. Update Rockstar Games Social Club to the latest version. If the game was not purchased through Steam, you may also need to download and install a Windows 8 compatibility patch available from Rockstar. If the above still does not work for the non-Steam version (and usually the game fails to start with no error message after the loading screen before leaving Windows), please reinstall the game to a location where there is no blank space throughout the target folder eg. if the game does not work installed in "D:\Program Files (x86)\Rockstar Games\L.A. Noire", please change the target folder to something like "D:\Games\RockstarGames\L.A.Noire". Then go through Rockstar's official instructions again in regards to installing the latest patches from Rockstar. This will limit the amount of graphical fidelity available by limiting the DirectX version used. This is caused by the display's overscan handling. See the Overscan entry for solutions, the linked article lists solutions for AMD, Intel and Nvidia chipsets. With certain controllers connected to the PC (e.g. 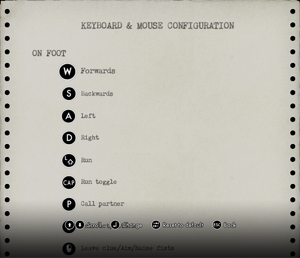 Wheel or Flight pedals) a bug can occur with controller set to disabled in the game menus the game still tries to accept controller input for some game controls and ignores keyboard input. Most notably this occurs when trying to drive cars. When using the DirectX 11 renderer, fullscreen mode always runs at 60 Hz, even if the screen refresh rate is set higher than that. Open <path-to-game>\dxgi.ini or %USERPROFILE%\Documents\My Mods\SpecialK\Profiles\LANoire.exe\SpecialK.ini depending on the installation method you used. Change OverrideRes=0x0 to the resolution of your screen (e.g. OverrideRes=1920x1080). Use Shift+Right Click on taskbar icon. Go to "Move" with keyboard. Use Arrow keys to move window and press ↵ Enter. Launch game as Administrator. If on Steam, exit Steam fully and launch it again as Administrator and then proceed to start the game. If the game doesn't launch, at least an error window should pop up. In the latter case, it may not be necessary to launch as Administrator after said error was resolved. 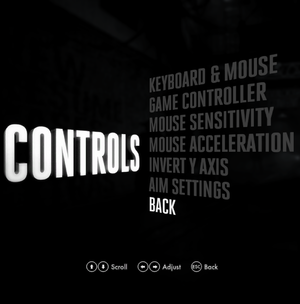 To input launch parameters you have to open the launcher of the game, access the Options menu. There you can write the parameters into the Command Line field of the launcher. You might have to start the game manually using LANLauncher.exe located inside the installation folder to see the launcher. It's noteworthy that Steam always starts the game using LANLauncher.exe. -ignorefocus Don't pause the game if you Alt-Tab or click out of its window. -joysticktype Force a specific DirectInput controller type. Can be used to try different controller button layouts if your controller isn't specifically supported. See Supported controllers. -mousefree Allow mouse outside the game window (requires windowed mode). -npd Disable the D3D_PUREDEVICE flag from device creation. 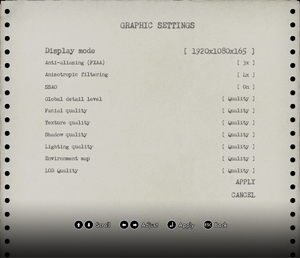 May help if you have graphics compatibility issues. -str Enable single threaded renderer, which may improve performance or compatibility on some systems. -windowed Run the game in a window. The following parameters are referenced inside the game's files and were likely intended for developer usage only. Their descriptions are taken directly from the game. There are many more that are completely unused, and therefore not listed here. -debugburn Make flaming people never die! -disablecrashhandler Disable the crash handler. -disablepost Disable Post Effects by default. -dmtf Disable the D3D D3DCREATE_MULTITHREADED flag, could improve performance at cost of stability. -dx11 Run the game using DirectX 11. -exit Exit immediately (skip the main loop) to test clean shutdown. -gamewells Allow the player to use gamewells even if no conversation exists. -noenvtextures Don't stream any environment textures. ↑ 1.0 1.1 File/folder structure within this directory reflects the path(s) listed for Windows and/or Steam game data (use Wine regedit to access Windows registry paths). Games with Steam Cloud support may store data in ~/.steam/steam/userdata/<user-id>/110800/ in addition to or instead of this directory. The app ID (110800) may differ in some cases. Treat backslashes as forward slashes. See the glossary page for details.